IT'S TOFFEE'S TURN: Najib is a Big problem, Mahathir is even bigger so what do we do? Najib is a Big problem, Mahathir is even bigger so what do we do? After a long absence I think it is time to put pen to paper again, this Government has done absolutely nothing to improve the situation in the country, the infighting in UMNO, which can be attributed to Najib's own doings has left him really hiding from the rakyat and the Country is in turmoil. It is because of this that toffeesturn is opening its pages again so that we may in our own simple and no nonsense way sensitize the Malaysian public to what is happening. Thi blog feels the urgency of restructuring government. That seems to be consensus - a national consensus, considering that the BN only received 47percent of the popular vote and that now even UMNO has split the ranks in as far as Najib goes with the youth really not in support of him forget the current sat about language used, the youth feels he must go. Our sources in Johor UMNO say they were approached because it is common knowledge that it is in Johor that a groupd of professionals in UMNO youth have even before the last elections been routing for Najib's exit. One of thier members in the elite group of professionals asked me, "how woudl you describe Johor's dismal showing at the last elections? A state that used to deliver 100 percent constantly suddenly went bad, why?" The he went on to say, "that is why the UMNO youth felt comfortable testing the waters with us firt Johor and our numbers are substantial, they the rest of the youth better learn to play their card's right or after Najib's ouster many heads will roll." Not a day goes by without a salvo being fired in Najib's direction by the opposition and the former Prime Minister Tun Dr. Mahathir Mohammed. Mukhriz has support from the ground and from the youth too, and Khairy knows that. After all Khairy won in a three way fight involving Toyo, and come the next elections Khairy is not going to have it that easy. The country is so preoccupied by the 1MDB fiasco, lavish spending by the PM's wife, the foreign press reporting the extravagance of the PM's wife and a suspicion of the PM's involvement in the affairs of the 1MDB scandal that there seems to be no time to govern. People are taking the law into their own hands a culture allowed to develop by the BN and especially UMNO since Najib came to power. The recent Kampung Medan affair is a clear example although UMNO is now trying to distance itself from the issue, it is no secret that one of the people who took a leading role in that protest was Petaling Jaya Selatan Umno Wanita chief Munaliza Hamzah who had failed to rest the state assembly seat in that area int he last elections. It clearly looked like an attempt to win popularity in that area at the expense of turning it into a religious issue attempting to win support. The situation is worse by the fact that even our Police force are directionless and clueless of what is right and wrong, more concerned with arresting citizens for speaking up rather than protecting citizens and their rights. Competence in the the ranks especially by the directorate comes into question, after some rather odd, misplaced and totally out of sync statements by the IGP himself, and his stand on the issue of the recent Church Cross incident in Taman Medan Petaling Jaya bears witness to this. Now this has really fortified the case of the public who suspect that the Police Chief is actually a pro UMNO secutity watchman and not independent head of the National Police force as he is supposed to be, and that he goes about arresting and humiliating people especially those who question the unusual happenings of this government that has hardly even begun to govern since it was last elected by a minority vote. The arrest of Rafizi and the Zunar are classic cases, cuff them put them in purple overalls and haul them in, what was their crime, did they go out with a group of gangsters and threaten anybody with violence? One is a Politician and the other a Cartoonist, but when allegations were made against the brother of the IGP who was pictured with a violent crowd, his brother was not picked up in such humiliating fashion, and that too in a case that did not lack criminal intentions. Why? Why this double standard? Will he even go after Petaling Jaya Selatan Umno Wanita chief Munaliza Hamza? She certainly had motive for that assembly. Why the double standards? Leaving the IGP aside let us focus on Najib again, our sources say that he has this genuine desire to let go,call it quits, there is jusst too much to answer for, but is being restrained by a 'greater force,' and that is all this reliable UMNO source would say. he said he'll give us a hint and asked to find out, for what and when was Najib once bundled into a four wheel drive and driven away. from his home under secrecy to attend a personal function in another state, he says the answer lies there. Who is this force will Mahathir be strong enough to intimidate this force to get Najib to concede and give up his position as PM? Certainly not. 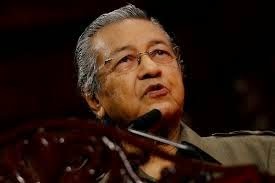 Mahathir will only compound one problem with another, and that may be even worse, but we need him now to attend to the urgent issue at hand to oust Najib or face the prospect of this country going bankrupt by the lavish spending ways of Najib Tun Razak the finance minister who is really not up to the job of either Finance Minister leave alone Prime Minster. that happens he is worried the opposition that will form the government will then dig and dig into the affairs of the people in the BN and many of them can suffer as a result." Dig into what, we know and Mahathir knows that as well that Anwar knows almost every secret of Mahathir's and that can be the only reason why Anwar has been incarcerated. Is that hard to believe? In 1988, Lord President Tun Salleh Abas was brought before a tribunal convened by the Prime Minister Dr Mahathir Mohammad on the grounds of misconduct. The Supreme Court in the years leading up to 1988 had been fiercely independent and increasingly active, and was at the time due to hear an appeal to determine the future of the ruling party UMNO, which had been declared an illegal society by the High Court of Malaya on the grounds of procedural irregularity. As a result of criticisms of the judiciary made by the Prime Minister, a letter of protest was written by Tun Salleh to the Yang di-Pertuan Agong on behalf of the judiciary. This letter was later used as grounds for the convening of the tribunal. When the Supreme Court granted an injunction prohibiting the tribunal as constituted from hearing the misconduct allegations, five Supreme Court Justices were suspended (and two were subsequently removed), and the injunction overturned. The tribunal later removed Tun Salleh from the office of Lord President, in which office he was succeeded by the then-Chief Justice of Malaya, Tun Hamid Omar, who had been the chairman of the tribunal. The 1988 constitutional crisis was widely considered to be the greatest blow to judicial independence in Malaysian history, and at the time led to the Bar Council of Malaysia refusing to recognise the new Lord President. Around the same time, the Federal Constitution was amended to disvest the courts of the "judicial power of the Federation", granting them instead such judicial powers as Parliament might grant them. Defying the most basic law, the Law of Natural Justice the then Chief Justice of Malaya, Tun Hamid Omar was the chairman of the tribunal that removed Tun Salleh Abas from his position as Lord President and the very same man Hamid Omar replaced Tun Salleh Abas. Tun Hamid the then Chief Justice of Malaya should have known that he had no business siting in that panel because of more than one reason, he was a subordinate of Salleh Abas the man standing accused, he had the most to gain by the removal of Salleh Abas and yet this Chief Justice found it proper to head the Tribunal, it was the biggest crime of the Mahatherian era. In 1994, in a move regarded as a further downgrading of the judiciary, the office of Lord President was renamed "Chief Justice of the Federal Court." The eroding of the independence of the Judiciary was because of this one move by Mahathir Mohammed, and this is exactly what allowed Mahathir and his successors to successfully prosecute and get Anwar jailed not once but twice on trumped up charges. 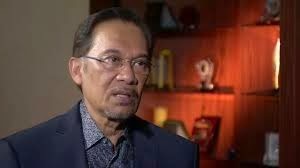 Anwar the heir apparent to Mahathir or at least what the people and maybe even he Anwar thought was not heir apparent at all. Mahathir had no plans of grooming this young man whom everybody looked on as a radical. Mahathir just wanted to contain Anwar and he did a good job of it, something that even today people have not come to grips with, including all the political observers and mavericks. A radical with a charisma of winning the hearts of the people, Anwar was gaining popularity from his position at the NGO ABIM and with that the Malay vote could swing if Anwar who was then a great friend of Hadi Awang in PAS aligned himself with PAS. Mahathir realizing this, brought Anwar to the UMNO fold and Anwar's popularity immediately showed. Many of his supporters in ABIM joined UMNO and very soon Anwar would become the leader of the UMNO youth with Najib as his deputy. Anwar managed to strengthen UMNO not for himself as he may have thought but for Mahathir and that is exactly what Mahathir wanted from Anwar and verything went it's way. Musa Hitam who was then the Deputy President was reported to have been against the move to bring Anwar int the UMNO fold. What Mahathir did not realise was that Anwar was his own person and Mahathir would eventually actually lose control of this so called protege of his. Anwar had always championed the poor and his ideas of UMNO were not to create a super rich segment of Malays but to uplift the poor using the NEP Anwar was an idealist and Mahathir a selfish businessman. Rememebr Mahathri came to power setting a goal for himself to creat 1,000 Malay Millionaires. After securing the position of Deputy President of UMNO replacing Ghafar Baba in 1993 against Mahathir's wishes as this man had brought in Anwar only to contain him Anwar continued to serve Mahathir as his deputy, until the financial crisis of 1997, when Mahathirs financial policies created the 1997 crisis fro which he blamed Soros, Anwar he openly spoke out about corruption, nepotism and cronyism. This was a direct shot at Mahathir and his policies as the country was really in bad financial shape, an Mahathir realizing this would expose him something he does to this day decided to get rid of Anwar. Today many of Najib's supporters point the finger ant Mahathir, they seay he too was corrupt, notice they do nto say Najib is innocent but they say Mahathir too was corrupt, but then is that an excuse for Najib to be corrupt if he is? Mahathir's fear is that the BN will lose the next GE and all will be exposed and many may even go to jail. If Najib is successfully removed which is a real possibility then we must ensure that Mahathir has no more big say in the affairs of Putrajaya. Supporting Mahathir and maintaining the balance. Should Mahathir be successful in ousting Najib he will then turn his focus to the opposition and Muhyiddin will have to do everything he orders like a puppet on a string for which Muhyiddin will get some goodies from the Mahathir basket, after all he Mahathir has often said he was a benevolent dictator and I suppose it is in this context. After removing Najib, his successor has enough time to implement Mahahtir's plan to undermine the opposition via the ballot box and everything else, including redelineation of electoral constituencies to give UMNO the advantage. Having said all this the dreadful consequences of what Mahathir can do we come back to the issue at hand and ask the question again. And the answer is a definitive NO!!! he must GO. How do we stop a Mahathir from running riot after he disposes of Najib? We must first realise that we need him to oust Najib, and we have to give him that privelage, after all Najib is his making, he cloned Najib out of a bunch of ill equipped followers, who were the scum bags of Malaysian politics. Ask Kit Siang and he'll tell you jut prior to operations lallang Kit Siang was questioning Najib on the allocation of a Timber concession to a person or company that had either his/or the Company's registered address in a low cost home, the pressure was on Najib then and as now he was not replying the next we know was that he went with Muhyiddin and Mohammed Taib to the Tun Razak stadium and threatened a racial riot after which Mahathir closed in and arrested many opposition parliamentarians including Kit Siang and Karpal under the ops lallang. If you rememebrr PD Mahathir saved him more than just once. So we need Mahathri now to undo those favours and get him out, that he must do. The real power lies with us the rakyat, we are the powers behind that office in Putra Jaya and we must use that power effectively. Come 1st of May there is to be a rally in KL to protest the GST, let us muster 2 million people on the streets if we can do that then everybody in this government will know their time of reckoning has come and they will have to govern rather then oppress their people. I would especially like to address thsi to those of you who are workers, those of you who have your monies in the EPF. Najib has his eyes on that money and make no bones about it, forget what the star says about withdrawal at age 55 it is only for the short term. It has already been announced that he intends to start a Islamic pension fund, the biggest in the world with the EPF funds, which means that you will not be able to withdraw your funds at 55, but rather the money will be given to you as a monthly pension. This was attempted before and we saw how low the payouts were that it had to be scrapped, looks like Najib is desperate to lay his hands on EPF. Could it be to balance the books on the 1MDB. Moreover the purchase of the 1MDB as Tony Pua has put it is going to cost every Malaysian as with the purchase of the various Independent Power Producers the electricity tariff is expected to go up and all Malaysian will be affected as a result. With 2 million people on the streets we will show Putrajaya where the real power rests, with us, wit us the people and then anyone who takes power after that will have to be wary of the people, only make sure that you may be called on again and again and if you respond each time b the end of this year we will get clean and efficient governance that is a surety. We'll send a message to all quarters including the Elections commission that they just can't trample on peoples rights and get away with it. One and a two million people on the streets will make a difference, a huge difference in a peaceful assembly the way that that only we Malaysians know ow to conduct.